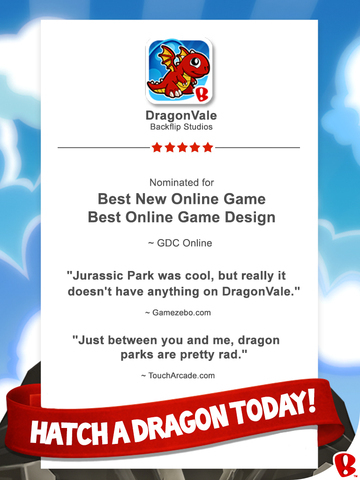 "BEST NEW ONLINE GAME" ~ GDC Awards Nominee "Just between you and me, dragon parks are pretty rad." ~ TouchArcade.com Hatched a dragon lately? Play DragonVale and raise, feed and breed your own lovable dragons. PLEASE NOTE! DragonVale is completely free to play, but some game items can also be purchased for real money. If you don't want to use this feature, please disable in-app purchases. DragonVale requires an internet connection to play (3G or WiFi). ALSO NOTE! By playing DragonVale you may find yourself hopelessly addicted to hatching and caring for adorable dragons. You may find yourself feeding them treats, watching them grow, building and decorating their habitats, and inviting others in to view them in their floating island home. 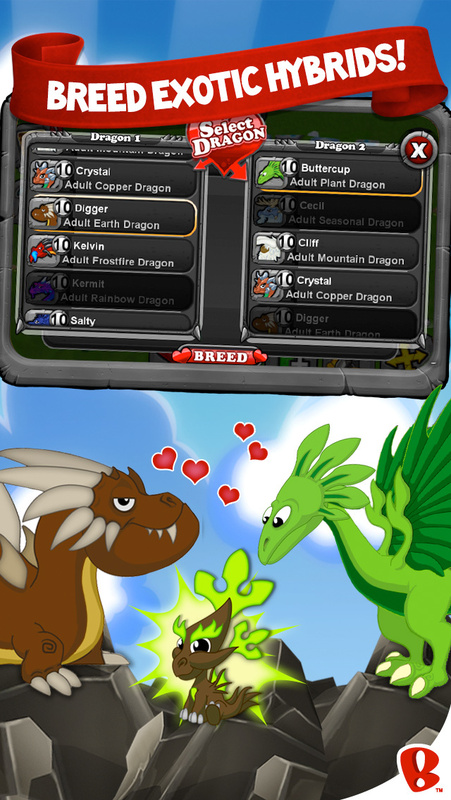 You may even find yourself choosing pairs for breeding, or racing dragons to compete for awesome prizes. 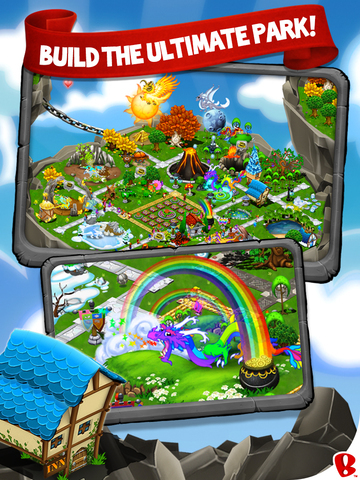 DragonVale is an enticing social experience from Backflip Studios that is sure to keep you entertained. You get: – Dozens of adorable dragons to raise – A magical island you build in the sky – Custom habitats where dragons graze – Dragon races where you win great prizes – Paths and decorations to delight your visitors – Farms to grow dragon treats – Full-color visuals and sparkling animations – An original Renaissance music soundtrack – Support for Game Center and Facebook to visit other parks and trade gifts Don't just take our word for it. Here's what the press has to say about DragonVale: "This new title has a depth and higher quality of art that’s reminiscent of the work that went into early console games." ~ VentureBeat.com "Jurassic Park was cool, but really it doesn't have anything on DragonVale." ~ Gamezebo.com "It builds up nicely, the art is colorful and fun." ~ TUAW.com And to think it all started with an egg. It's free! ______________________________ DragonVale is brought to you by Backflip Studios, makers of absurdly fun mobile games like Paper Toss, NinJump, Ragdoll Blaster, Strike Knight, Army of Darkness, Shape Shift and Graffiti Ball. Search the App Store for "Backflip Studios" to see all our apps. • Treatery – an event reward that allows players to gift other players with magical dragon treats!